Despite three consecutive losing season with a total of 11 wins and six years since they’ve last been to the playoffs, the Jacksonville Jaguars are patient in the direction they’re taking, which means they won’t rush rookie quarterback Blake Bortles into anything, instead letting him sit on the bench behind Chad Henne and gradually grasp what it takes to be an NFL quarterback. Chad Henne is a solid quarterback. Nothing brilliant, but he is steady through his career with a passer rating that is in the 70’s. Even if he isn’t a Pro Bowl level QB or even close to that, the former Michigan star isn’t the reason the Jags won only four games last season. However, teams are always about having or prepping their next franchise quarterback or the potential one. Bortles, taken with the third overall pick, was the first QB selected in the draft, and for many it felt like something of a reach, even if he was the best in his position. When a team pays so much money to player right off the bat, it feels quite weird to have them not use him, even if the school of letting quarterbacks develop slowly instead of putting them in a bad situation, like Blaine Gabbert who soon turned out to be the wrong guy for the job, which makes it very difficult for even the more talented players to succeed. 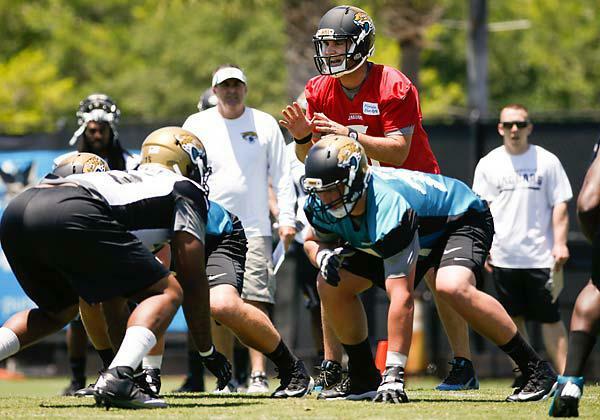 Bortles broke out with Central Florida in 2013, but that didn’t make him, like the rest of this quarterback draft class, a player that looks like he’ll be a capable starter. Everyone loves to compare quarterbacks in the last couple of drafts to Andrew Luck and Robert Griffin III, who looked great right away. Russell Wilson didn’t come in with that kind of attention but is already a Super Bowl champion. It’s probably more about the situation you’re put in than anything else, and Bortles wouldn’t have succeeded or guided his team to many wins, which means it’s probably for the best to have him sit back and grow into the system instead of burning him on a bad team right away.